Shawnee Town 1929 has recreated a late 1920's truck farm which is a composite of truck farms in the Shawnee area. Rather than a restoration or re‐creation of any one particular residence, it utilizes an assemblage of representative truck garden farmstead buildings on a portion of the museum grounds. It is comprised of a relocated house that was built by Joseph Scudder Hart and his wife, Wilhannah in 1877 on their 106 2/3 acre farm near today’s 75th Street and Quivira Road. Belgian immigrants Victor and Erma DeCaeny bought the house and property in 1926. The house is furnished based on oral histories from descendants of the DeCaenys and typical house furnishings of 1929 Johnson County. There were major differences in farming practices in Johnson County and within Shawnee Township itself in 1929. In 1929, Shawnee Township had 195 farms with an average farm size of 85.78 acres, the smallest average acreage per farm in Johnson County. Western townships and eastern Oxford Township had larger farms and large acreage devoted to wheat, corn, and oats. Although Shawnee had a significant amount of ground devoted to wheat, corn and oats, like the rest of the county, Mission and Shawnee townships‐‐the townships closest to Kansas City‐‐had the lowest acreage in those crops than any other county township. 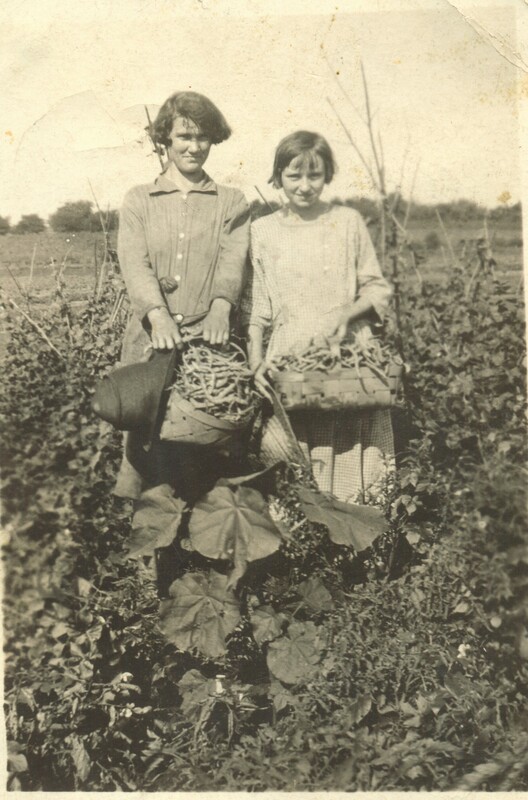 Dwarfing other townships in the production of sweet potatoes, in 1929, Shawnee Township families planted 55 acres of sweet potatoes. That specialty proved so successful that it grew to 168 acres in 1934. Shawnee Township family farms produced twice as much cheese than any other Johnson County township and was second in home butter production and in the amount of milk or cream sold for the city trade. The Township farmers also produced a significant number of poultry and eggs. Probably reflecting the small size of their farms, Shawnee Township farmers had 2.3 horses per farm and .6 mules, the fewest horses and mules per farm of any other township. This can be compared to Gardner Township in southwestern Johnson County, which had 5.1 horses and mules per farm, the highest number in the county. Belgian farmers, who farmed in the Kaw Valley, and many other Shawnee farmers within easy reach of the Kansas City Market, became truck gardeners. The proximity of Shawnee to Kansas City also encouraged township farmers to raise milk cows and produce cheese and milk or cream for the city market. Farmers in western Shawnee were more likely to farm the land with wheat, oats, and corn. Most truck gardeners apparently focused on producing vegetables and fruit for the city market. The cheese and cream market farmers were a separate market farm specialty. While Shawnee Township farms were small in comparison with other Johnson County farms, truck gardeners had even smaller farms than the average township farms. Truck gardening was so labor intensive that large acreages were not practical for a family operation. The typical market garden farm was only 10 to 20 acres, and did not require the high capital costs of other commercial farms. They could use smaller farm implements for their smaller acreages, and needed fewer and even less powerful horses to pull the smaller equipment. According to oral histories gathered from descendants, truck gardeners raised a variety of vegetables for the Kansas City market in the late 1920s and 1930s. From the historical records and oral history interviews conducted by Shawnee Town 1929 staff between 2004 and 2007, Shawnee truck gardeners grew apples, asparagus, beets, broccoli, butter beans, cabbage, carrots, cauliflower, cherries, Hubbard squash, dill, garlic, grapes, green beans, green onions, green peppers, kale, lettuce, lima beans, onions, oyster plants, parsley, parsnips, peas, peonies, popcorn, potatoes, radishes, raspberries, rhubarb, sage, shallots, spinach, strawberries, summer squash, sweet corn, sweet peas, sweet potatoes, tomatoes, turnips, watercress, white scallop squash, and yellow squash. Sweet potatoes were a specialty crop for Shawnee truck gardeners. They raised significantly more acreage of sweet potatoes than any other township in Johnson County, increasing from 55 acres in 1929 to 168 acres in 1934. Even though individual truck gardeners may only have grown 1‐2 acres of this crop, that still represents about 10% of the cultivated land of the typically small truck gardens of 10‐20 acres. Clearly, there was a strong market in Kansas City for sweet potatoes. While it is unclear why this was true, it may be related to a regional in‐migration from the Upper South; people for whom sweet potatoes were a favorite food. Shawnee truck gardeners of 1929 farmed with relatively simple equipment that was not unlike the equipment used by their fathers and grandfathers in the 19th century. Truck gardening was labor intensive, and most of the new technology was designed for large acreages of corn or grain. Few truck farmers bought tractors for their small fields. Most continued to use horses to plow, disc, harrow, and cultivate their vegetable crops. Their equipment was relatively small and light. Although few truck gardeners bought tractors and larger equipment or used hybrid seeds, they did use the internal combustion engine in many ways. Some bought gasoline engines for washing clothes or pumping water or simplifying other farm tasks. Many truck gardeners, like the DeCaenys, enthusiastically embraced automobiles for family transportation and trucks that could take their produce to market more quickly and comfortably than horse‐drawn wagons. They participated in modernization of their homes and barns, installing electricity, gas, and telephones when available in their neighborhoods (in the early 1930s in Shawnee). Raising vegetables, however, was still a matter of hand planting, hoeing, and hand picking, while their horse and hand operated implements sufficed for most other tasks. With a truck, they could transport their crop to market quickly and securely, but their small acreages made major capital expenditures for production unnecessary. In line with their simple and straight forward gardening methods, few Shawnee truck gardeners irrigated their land, though irrigation of truck gardens may have been common in other areas. Chemical fertilizers were not widely used until after World War II, so in 1929, some Shawnee truck farmers returned home from market with a load of manure to spread on their fields. The modern era of insecticides did not begin until the introduction of DDT (Dichloro‐diphenyl‐trichloroethane) in 1939 by the Geigy Company. It was used by the U.S. Army during World War II to control lice that carried typhus, and then became widespread to control insects in farm fields and on livestock after World War II. Synthetic pesticides quickly became widespread in the 1940s and 1950s. Shawnee truck gardeners relied on their grandfather’s remedies for insect control in 1929. Arsenic was a popular insecticide that Shawnee truck gardeners applied as a dust to control a range of insects. Along with two other mineral‐based insecticides‐‐mercury and lead‐‐arsenic had been in use by farmers since the 15th century. Plant‐based insecticides like nicotine sulfate from tobacco leaves, pyrethrum from chrysanthemums, and rotenone from the roots and stems of a variety of plants in Asia, Africa, Australia, South and North America were available to them. Farmers and gardeners used these insecticides widely during the nineteenth century. Farmers could either dust or spray their plants when the plants became infested with insects. Kansas State Agricultural Experiment Station offered advice to vegetable gardeners for the control of insects. The Kansas Experiment Station’s primary recommendation for controlling insects in 1918 was a spray containing either lead arsenate or paris green. Paris green (copper acetoarsenite) was used as a pigment in green paint that Sherwin Williams Co. began to sell as an insecticide and animal poison. The Experiment Station also recommended Black Leaf Forty, which was the product name for a nicotine sulphate concoction. Other recommendations were kerosene emulsions, tobacco water and soap for aphids, poisoned baits of paris green and bran for cutworms, and mechanical methods like placing cutworm barriers around the stems of vegetables, like tomato and cabbage. Perhaps even more importantly, truck gardeners, like other gardeners, used hand‐labor and cultural practices that had been in use for generations to control insects. These included rotating crops so insects could not target a single crop on the same ground year after year, deep plowing, and even hand picking insects. Historically, farmers used mechanical and cultural practices to control weeds. They plowed and prepared their ground carefully, trying to eliminate any early sprouting plants. They planted vegetable seeds clean of weed seeds as soon as possible after preparing the ground, so newly sprouting weeds did not get a head start on the vegetables. Then as weeds appeared, truck gardeners pulled weeds by hand, and hoed their crops. They tried to uproot them when they were small and before they could compete with the vegetables they were growing and to prevent them from going to seed. While it was hard work, this approach was workable for the smaller acreages truck gardeners farmed. Shawnee truck farmers did not use herbicides in 1929, largely because they were not available. Chemical herbicides were developed for grain crops in the early 1900s. Arsenic in the form of sodium arsenite was the first modern chemical herbicide developed and first used by the U.S. Army Corps of Engineers. 2,4‐D was the first synthetic chemical herbicide used extensively for agricultural purposes. It was also the first selective herbicide. Developed by Dow Chemical and Sherwin Williams Paint Company, it was introduced for agricultural use in 1945. It killed only broad‐leafed plants, like thistles, mustard, dock, and other invasive agricultural weeds. It was soon followed by many other chemical herbicides. Truck farmers preferred light soil. It was easier to work, and warmed up more quickly in spring, thus ensuring early vegetables. Unfortunately, as a result of its underlying shales and limestone, much of the soil in the Shawnee Township is heavier silty clay loam. Heavy soil like clay loam is harder to work and is slow to warm up. It is more prone to runoff than lighter soils. Three major factors combined to make its heavy soils. The Township’s underlying bedrock is composed of shales and limestone. The Kansas (or Kaw) River embraces the county on the north and west ends as it bends up to meet the Missouri River. Turkey Creek to the north and Brush Creek to the East also run through the Township. All of these have eroded the land nearby, created rolling and some steep hills on those edges of the township and have also added floodplains and clay soils to the landscape. As a result of its soils, Shawnee Township did not lend itself to irrigation, a common activity in many truck gardens with lighter soils. Some of the township is on land with hillside slopes of 15‐45%. That land was less suitable for truck gardening. Commercial chemical fertilizers were available in the 1920s, but neither truck gardeners nor farmers used them much. The golden age of chemical fertilizers began in the 1940s in conjunction with other changes like hybrid seeds. Truck gardeners continued to haul manure onto their farms to increase their gardens’ fertility. The Kansas State Agricultural Experiment Station recommended farmers apply up to fifteen and twenty loads of manure to the acre. While truck gardeners saved seed Irish potatoes and seed sweet potatoes to start their crops from in the spring, most of their seed was purchased. Most of their vegetables were open‐pollinated. Improved varieties were common, but hybrids were only just entering the vegetable market. According to oral histories of Shawnee area truck gardeners, most truck gardeners got their seed from Standard Seed in Kansas City. Midwest Seed Company was another supplier. Some farmers got their seed from traveling salesmen who took their orders and placed them with an out‐of‐state supplier who shipped the seeds to them in the mail. Truck garden families depended heavily upon family labor. Girls and boys worked in the gardens with their mothers at an early age. The work that men and women performed varied by family, but in Belgian families, there was little difference between the work that men, women, girls, and boys had to perform in the fields. At the same time, though, women still had to keep the house, birth and take care of children, cook and preserve food, wash clothes, and the myriad other tasks. The person who took the produce to market in Kansas City also varied from family to family. Joseph Boutte provided an example of a daily work schedule and gender roles for his Catholic Belgian family truck garden. They operated 10 to 11 acres. They started work at 7:00 in the morning. His mother was the leader of the crew, which consisted of herself, Joe, who was an only child, and one hired hand. He noted that other operations hired additional high school kids to help out, but theirs was a relatively small farm. His mother left the field at 11:00 to serve dinner at about 11:30. She went back to the field to work, then went to prepare supper at 5:00, which was ready at 5:30. There was no market on Sundays and Tuesdays, so the family didn’t "fix" for the market on Saturdays and Mondays. On those days, his mother did laundry and cleaned the house. When tomatoes were ready, the crew picked until Noon, and his mother packed in the afternoon. His mother was a better packer, so the men spent more time harvesting, and his mother worked more in the market shed. His father generally took the produce to market (Joseph Boutte interview). June Kuykendal’s family was somewhat different. Her family was a Catholic Polish family that moved to Shawnee from Kentucky. They also operated about 10 acres of truck garden. Their truck garden was more of a retail operation that sold directly to retail customers at the Kansas City Market. Her mother milked the cow and worked in the house. Although she did some garden work, she focused most of her work in the house (June Kuykendal interview). Hired hands were also common on larger truck gardens. The VanLerberg farm, for instance, was 120 acres, very large compared to most truck gardens. The VanLerbergs had four hired men and hired 6-8 high school students to work on the farm in the summer. Combined with the six family members, there were a total of 18 people working on the truck garden during part of the season. According to Ben Nicks, he earned 10 cents an hour picking crops as a child (Nicks interview—Coffee Morning 1).